Home Tech News BSNL Is Offering 10 GB Per Day Data To Compete With Jio . BSNL Is Offering 10 GB Per Day Data To Compete With Jio . From September 2016 , with the entry of jio telecom network the surrounding of competition arise between network operators to compete with jio's aggressive plans .In the beginning there were tough competition between Jio , Airtel , Vodafone And Idea Network OperatOrs . But from few months BSNL also entered in this competition and launching more aggressive offers with the passage of days . In previous days BSNL launched 429 Rs Plan . 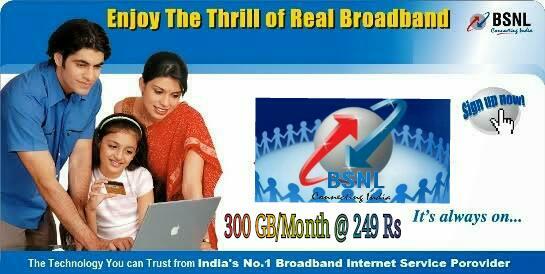 Now BSNL launched new exciting offer at just 249 Rs . According to this offer users will get 20 GB / day data . BSNL has announced a new broadband plan that offers 10GB data per day at just Rs 249 per month. BSNL's new Unlimited Broadband at 249 also offers unlimited calling . However The executive explained that users will get speeds of up to 2Mbps till 10GB data download after which the speed will be reduced at 1Mbps. The new Rs. 249 plan is valid across all circles where BSNL offers its services except J&K and Andaman and Nicobar regions. Any data not consumed from the 10GB cap will be carried forward to the next day.As we discuss above an add-on, the Rs. 249 plan will also offer unlimited free calls between 9pm to 7am. The BSNL executive added that the unlimited free call will extend to all Sundays and calls to any network in India will be free. BSNL’s Chairman and Managing Director Shri Anupam Shrivastava expressed that, BSNL is the only operator who is offering lowest per GB data download cost plan. Now this statement endorsed by this new launch of BSNL 249 broadband plan. As a result, BSNL is going to set a new benchmark in minimum tariffs scale among high-speed internet plans. Surely this plan is going to attract new customers, to experience affordable high-speed BSNL Broadband services. Take a look at below for the best affordable budget unlimited broadband plans (BSNL 249 Broadband Plan) tariff. BSNL BB 249 Unlimited Plan will be available for new BSNL Broadband users only . As the plan is available only for new users so existing users can would not enjoy the BB 249 unlimited plan . If any migration requests to any other unlimited plan, not given before One Year. This BSNL 249 broadband plan should automatically convert to ‘BBG Combo ULD 499’. BSNL from the subscriber obtains Customer’s consent in this regard . For migration) at the time of Customer Application Form filling. Same Landline number is to be not assigned to such consumers, who disconnect existing landline to avail low-value BSNL 249 broadband plan.